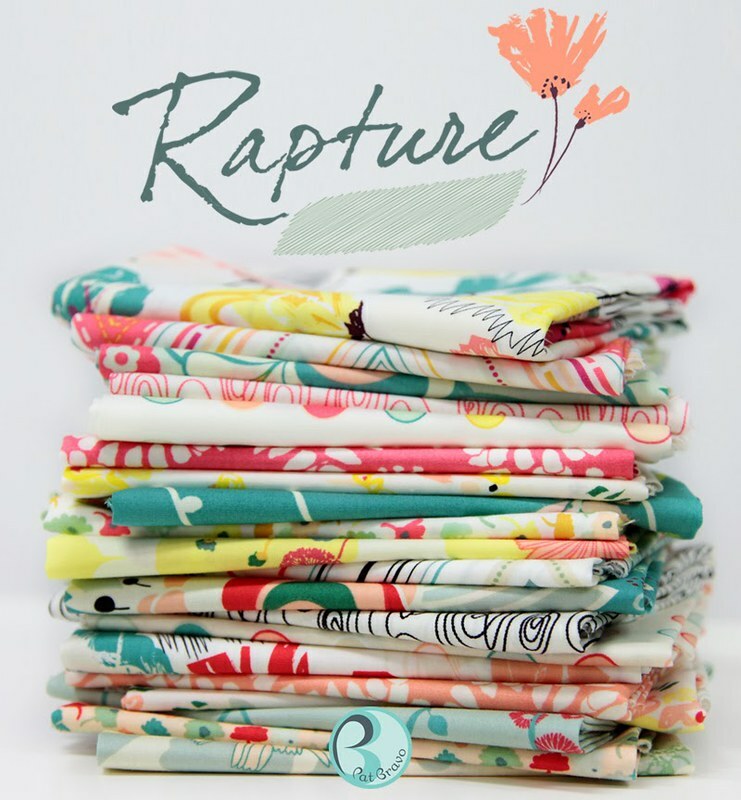 While I wait for the snow, ahem, to melt to take photos of my newly finished Rapture quilt, my friend Pat and I thought it would be fun to have a special midweek giveaway! Pat Bravo is the Creative Director behind Art Gallery Fabrics and Co-founder, along with her husband Walter. In 2004 Art Gallery Fabrics was born out of a desire to bring creative, chic, and modern fabrics to the quilting industry that are not only gorgeous and sophisticated in design, but the quality is like nothing else on the market! Over the years Pat has produced so many amazing collections including Summerlove, Indie, Rock 'n Romance, & Rapture just to name a few! Be sure to check out this sneak peek of her latest, NouvElle, and to visit and follow Pat here, if you're not already! We hope you enjoy visiting Pat Bravo's sites!! Today Pat is offering to two winners, one Half Yard bundle in one colorway each, from her gorgeous Rapture collection! This time the winner's choose their favorite, between Subtle Joy or Citric Happiness! If you visit my blog often, you know that I'm such a HUGE fan of Pat and of all things Art Gallery Fabrics! I'm so very excited to be able to share these gorgeous fabrics here with all of you, and to be able to offer this special Fabric Giveaway today! That’s 4 possible entries! Enter now through Wednesday morning, April 23rd. I will pick the winner at random and I will announce their name at the bottom of this post, here on my blog! Congratulations winners, I will be in touch shortly! love it all, but especially Wild Beauty Pineapple! It's hard to pick just one - but I'd have to go with Wild Beauty Pineapple! Bon Bons Candy is probably my favourite but really I love them all! Gosh, that is hard. They are all beautiful.......... If I have to choose, Wild Beauty Pineapple. i love the Euphloria Viridian! thanks for the chance to win! Dreamscape Sun is my favorite. It's all the colors of my home. Very sunshiney! Also following you in FB! I like the marvel cherry! They are all so pretty! I love the Butterfly Bliss fabric, teal or aqua, but teal better. My facorite is Euphloria Viridan. Love the name, love the fabric! Thanks! Follow Pat Bravo on Facebook. Wild Beauty Pineapple is gorgeous! That's my favorite! Follow you on facebook and Instagram. I follow Pat on Facebook. Thanks for the fun! I'm now following Pat's FaceBook page, too! I follow you on Facebook and Bloglovin Maureen! I love the florals so gorgeous! Love All the Prints!! Sooo Pretty~ Thinking my favorite is the Wild Beauty Pineapple! Thank you Maureen & Pat for a great giveaway!! I am now following Pat Brovo's blog and Facebook page. I follow your blog and Facebook page, Maureen. I love the abstract flowers! I love them all. These are PERFECTION! I follow Pat on Instagram! Hypnotic paramour red. Beautiful fabric but I really, truly love the name. Delicate Femme Vanilla is my favorite. Such a sweet versatile print. Would have to say wild beauty saffron. I follow you on bloglovin - and i like them all!!!! I love the Butterfly Bliss Aqua. I love the Saffron Caramel. I like Wild Beauty Pineapple. No wait, I mean Saccharine Lemon. No wait, I mean .... heck, I like 'em all!! Thank you for the suggestion. I'm now following Pat on Facebook. Started following Pat on Facebook. I have shared your FB post too :) Thanks for such a lovely giveaway! Ooh that's hard to choose, Maureen - I love the Bonbons Cerise because I'm all about polka dots, but both the Butterfly colors are gorgeous, too! Butterfly bliss, love the teal! But I really love them all! I follow you on Facebook and Bloglovin'. Dreamscape Moon is probably my fave. All of them are lovely. Butterfly Bliss Aqua is so airy and delicate. It is one of my favorites. Follow you on FB, instagram and the blog. I follow Pat on Twitter! I just started following Pat on Instagram. I especially love the wild beauty pineapple! Wow, dont make me choose just one...LOL I love them all! Dreamscape in either color way. They are both yummy! What a beautiful new line of fabric. Maureen - I follow you on FB & Instagram! I follow Maureen Cracknell on Facebook. Sharing on facebook as we speak! My fav is Dreamscape Sun! Euphioria Viridian is my favorite but they're all lovely and lively! Love the whole line. Hard to choose.......I really like Butterfly Bliss Teal!!! Thanks for the opportunity. I follow you on Facebook and e-mail. I follow Pat Bravo via facebook. I pinned the bundle and giveaway. Thank you! I follow you via facebook and email. And I follow Pat Bravo on FB, too! I love both of the the butterfly bliss prints! So pretty! I love Butterfly Bliss Teal! Beautiful fabric! I follow Pat Bravo Designs on FB and Instagram too. 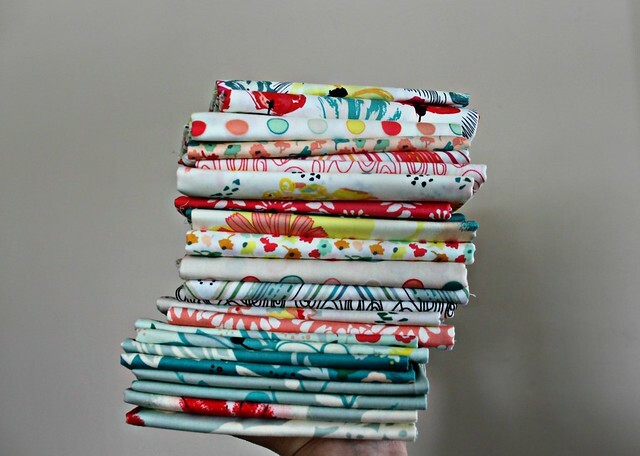 I really like the Citrus Happiness fabric, especially Butterfly Bliss in Teal! 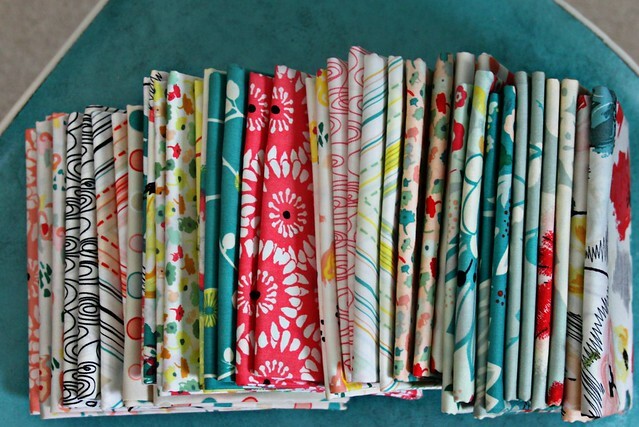 love the fabric and would love to make a quilt! My favourite print from the Rapture collection is Euphloria Viridian in the Citrus Happiness colour way. A very nice collection indeed. Mmmmm...butterfly bliss in teal or aqua and the Bonbons candy! Thanks! My favorite is windswept ruby. I love the wild beauty pineapple!! I love the hand-drawn beauty of Wild Beauty pineapple. I like Pat Bravo on fb. I L.O.V.E the dots and zig-zags! My favorite is Euphiora Coral! Hypnotic Paramour Rose is one of my favorites. Even the name is awesome. I follow Pat on Instagram. I also already follow you on facebook! I like MCH on fb. As for a favorite depends if is for accent, border or main print. Love the Marvels, Dreamscape is a must but then I am swept away with Windswept. So it comes down to at least a fat quarter of each or jelly roll plus yardage to finish. My favorite is Euphloria Viridian!! Beautiful collection!! I am so in love with 'Euphloria Coral' (RPT-2704)!! Lovely one!! Following Pat Bravo on facebook! How mean to make me pick just one....I can't I love them all. That's my story and I'm sticking to it. Rapture has all the colors I am loving and drawn to right now! I follow you Miss Maureen! All of these strike my heart in a beautiful way but the blues especially. I shared this on FB and IG and have followed all people requested for 4 entiries. Good luck to all of us! Love the whole Subtle Joy collection, but my favorite out of the group is Euphloria Coral! Beautiful! I also follow Pat with rapture....ahhhhhhhhhhhhhhhh. Of course I follow you on FB too! I follow you on bloglonin! I am your devoted follower Maureen! I love your blog! Only one? ok the white background with the small scattered flowers.